Egypt is one of the most fascinating destinations on the world tourist map. This extra ordinary country is today the favourite vacation spot for many, just like it was in the days of the early Greeks and Romans. The thoroughly cultured Greeks, in particular, were fascinated by this civilization that predated theirs by at least 2000 years. The biggest draw continues to be the amazing abundance of historical treasures- temples, pyramids and museums -contained in this one country. But the destination offers more than just the wonders of antiquity. Your visit to Egypt can be rounded off by a cruise down the Nile and a beach vacation at the top notch Red Sea and Sinai resorts. The unification of the Kingdoms of Lower and Upper Egypt around BC 3180 marks the point from when Egypt became a significant power. This event is credited with Menes, who thus became the first Pharaoh. Menes went on to establish a new capital at Memphis, just to the south of where Cairo stands today. For the next 3000 years and under 30 dynasties of the Pharaohs, a dynamic and culturally sophisticated civilization flourished. It was not however smooth sailing for the descendants of Menes and power was for short periods in the hands of foreigners. Historians who as usual want to simplify things, have divided up the reign of the Pharaohs into three periods: the Old Kingdom (2575-2134 BC), Middle Kingdom (2040-1640 BC) and New Kingdom (1550-1070 BC). Egypt is today a modern vibrant nation that carries the burden of its 5,000-year history graciously. Just like in ancient times, the Nile sustains the country and upto 95% of the population live in close proximity of the river. The rest of the country is desolate desert, mitigated only by a few isolated oases and the habitable narrow strips along the African Red Sea and the Mediterranean coastlines. According to the tourism ministry, Egypt for the visitor is best seen as six tourist super-sites. This covers the most popular destinations and excludes off-the-beaten-track locations. The six super-sites are anchored on: Cairo, Alexandria, Luxor, Aswan, Hurghada on the Red Sea and Sharm El Sheikh in Sinai. Except for Luxor, none of these destinations relies entirely on ancient monuments to attract visitors. <font color="#0000FF"> Egypt tours and vacations</font> are very competitively priced relative to other destinations. Cairo is a huge, sprawling and chaotic metropolis. It has all the amenities of a modern city and is the usual gateway for the visitor to Egypt. Cairo is a young city relative to nearby Heliopolis, Giza and Memphis that are associated with the Pharaohs. The city began as a Roman trading post called Babylon- in the area now referred to as Coptic Cairo. The area was a settlement of one of the world's first Christian communities. This predominantly Christian locale houses a museum that is a repository of religious art, manuscripts, paintings and pottery. But it is the Arab invaders who arrived in the 7th century who can be said to have founded the city. They settled just north of the area referred to as Old Cairo. The medieval district of Islamic Cairo is densely packed with people and lots of mosques and temples. This is where many still go during the month of Ramadan to eat and spend the night after a days' fast. Giza on the Niles' west bank is where you find the Great Pyramids. These truly magnificent monuments were one of the Seven Wonders of the Ancient World. You will appreciate the achievement of the builders of these edifices when you reflect on the fact that until the 19th century they were the world's largest buildings. 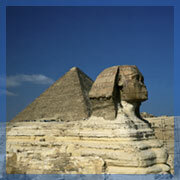 The visitor to Cairo will easily tuck in trips to see museums, mosques and monuments such as Pyramids and the Sphinx. To commemorate your visit to this unforgettable city, visit the Khan el-Khalili Bazaar. The wide array of souvenirs on sale here includes jewelry, brass, silver and copperware, carpets, perfumes, alabaster and soapstone carvings. You will also find reproductions of antiquities, which you are advised to buy as opposed to anything presented as original. Such "originals" are usually counterfeit, and it is in any case illegal to export the real article. If your primary interest is ancient Egypt, bear in mind that about 80% of Egyptian antiquities are in the vicinity of Luxor. The city sits on the site of the ancient city of Thebes and together with the surrounding areas carries magnificent treasures of antiquity such as palaces, temples and royal tombs. The royals of those times whiled their afterlife at what is referred today as the Valley of the Kings, Valley of the Queens and Tombs of the Nobles. The tombs contained treasure that has been plundered over the centuries. Some of the more famous tombs are those of the boy king Tutankhamen and the queen Nefertari. On the east bank of the Nile you find the Temple of Luxor and the Temple of Karnak, packed with obelisks, wall murals and statues with heads of gods. If you overnight here, enjoy the evening sound-and-light show at the Temple of Karnak. Temples on the west bank are Queen Hatshepsut's Temple and The Ramesseum, a once massive edifice that is today mostly a ruin. You need to spend at least two days here for your trip to be worthwhile. You are also advised to hire a guide who can explain the historical context of each artifact or monuments. Start out early each day before the day-trippers, airlifted from Cairo arrive to crowd you out. Aswan, a scenic town by the Nile lies 680 km to the south of Cairo, in the region that was so long ago known as Lower Egypt. Though not as numerous as elsewhere, you can find temples and tombs at those two islands in the Nile- Elephantine and Kitcheners islands. You can get to the islands by sailing in a felucca. The Nubian Museum celebrates the history and culture of the Nubian people. Aswan is also important in the history of Coptic Christians and the ruins of the 7th-century Coptic monastery of St. Simeon laze in this area. In today's Egypt, Aswan is important as the location of the High Dam that finally put an end to the annual bursting of the banks of the Nile. Sinai is where Africa meets Asia. Like the Red Sea coast, it has top resorts and is great for water sports. Sharm El Sheikh, towards the southern tip of the Sinai Peninsula is the most developed resort town. Here you will find entertainment in the form of casinos and nightclubs and also some good shopping malls. The marine life is abundant and the coral reefs are great. Sinai is also where the three great monotheistic religions meet. You can make an excursion to Mt. Horeb, said to be Mt. Sinai where Moses received the Ten Commandments. For Roman Catholics, emulate Pope John Paul II who visited nearby St. Catherine's Monastery in 2000. The monastery is supposed to sit on the site of Moses' burning bush. The people of Egypt from antiquity to the present day have always built their lives around the Nile. It is no coincidence therefore, that probably the best way to see the major sites is by taking a Nile Cruise. There are several luxury cruise ships offering Nile Cruises. The longer cruise goes all the way from Cairo to Aswan in two weeks. There is however not much to see between Cairo and Luxor and you will get better value if you take the shorter cruise between Luxor and Aswan. This cruise, which normally takes six days, goes in both directions and you can embark at either Aswan or Luxor. You can get to Luxor or Aswan from Cairo by taking a flight or the overnight sleeper train. The adventurous and thrifty can also sail along the Nile by using traditional boats, feluccas. The summer in Egpyt, which falls between April and October, is hot and dry. The winters are mild with cold nights. The best time to visit is between November and March, outside the intolerable summer season. Light clothing is generally recommended though you may need a sweater and jacket for winter evenings. Remember that this is a Muslim country and dress for women in particular is expected to be modest. All the same, immodest western style holiday dress is acceptable in nightclubs, beaches and hotels in Cairo and other locations frequented by tourists. Andrew Muigai is editor of AfricaPoint Insider online newsletter. It is part of AfricaPoint.com- the Africa travel website that has helped thousands of travelers discover Africa. You can view more info on Egypt tours and vacations at the website. ©Copyright 2019 CheapAirlineTicketsDepot.com. All rights reserved.